In 2006 PACE (Partners for the Advancement of Collaborative Engineering Education) approached Brigham Young University (BYU) and asked them to be a part of a collaborative engineering project that would span the globe. Since then students at 19 universities, on 4 different continents, spanning 16 time zones have been working together, and have built two formula-one style racecars. This kind of global collaboration requires a lot of communication and verification of design. Students quickly found that when the suspension for a car is designed in Seoul, Korea, manufactured in Aachen, Germany, and assembled in Provo, Utah there needs to be some way to ensure it will meet all requirements before it is manufactured and shipped. MSC software was able to provide this verification. Students in this project have been able to use programs like ADAMS to simulate the motion of the car and its components. This virtual assembly of the car along with other models helped to avoid problems during the assembly process. Another concern when designing a racecar is safety. This car is designed to reach speeds of 150 to 200 miles per hour. At those speeds safety of the driver and others is a priority. To ensure safety, students perform hand calculations as well as use software to determine the pressure applied by air and the reaction of the components to that interaction. 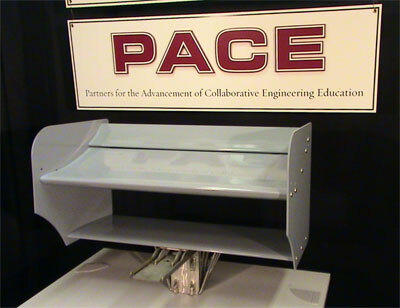 This year the PACE team at BYU has worked to build a rear wing box and an engine cowling for the PACE formula one car. Both of these elements underwent analysis in Nastran to ensure they would hold up to the loads they would experience when traveling at race speeds. Loads were calculated with computational fluid dynamics and then were applied as pressures to a model of the rear wing. Models were meshed in HyperMesh and then solved in Nastran. Using this analysis students were able to calculate the displacement and stress that the rear wing box and engine cowling would experience. This allowed students to reduce the stress and prevent failure during extreme speeds. These projects used carbon fiber and the use of Nastran allowed for optimization of the carbon fiber layup allowing the wing and engine cover to be light and strong. the rear wing box have all been analyzed and have been shown to withstand the loads that will be applied. These components have been manufactured and students hope to be able to analyze the assembled part in the near future. This is an ongoing project and the BYU team is currently optimizing the ply thicknesses of the carbon fiber layup for the engine cowling. As the project continues the team hopes to verify their virtual results with real tests when their car makes it's first run on the track.